This report brings together existing research around the patient experience, the clinical effectiveness and the safety of osteopathic practice. It is full of useful statistics and information, relevant to anyone who has an interest in finding out more about osteopathic practice and the evidence that there is available; whether as a patient or a member of the wider general public, a private or NHS commissioner of service or other colleagues in healthcare. It has been written as a resource for the osteopathic profession, to help document and simplify the existing research that exists in osteopathy. We would like to extend our sincere thanks to the National Council for Osteopathic Research (NCOR) who contributed to the content in the report. 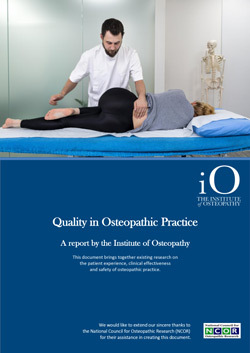 The Quality in Osteopathic Practice report is a working document, which will be updated on a regular basis, as and when new research and evidence-based information is released. Members are encouraged to link to this document from their website and are also welcome to repurpose the content in their marketing materials.